Choosing the best Powerstroke performance injectors will improve power and fuel mileage. A Full Force Diesel custom built performance OEM replacement injector set can give you more power for towing and everyday driving. Our injectors are hand built by skilled technicians to give you many years of worry free performance. Internal modifications and nozzle modifications optimize the fuel delivery to give you the most power with the least amount of wasted fuel. We convert these injectors from a split shot to a single shot which offers more performance and better efficiency. Full Force Injectors will fix any symptoms associated with bad injectors like poor idle, missing, hard starting, and white smoke. With these performance optimizations, the correct injector size for your application can give you the best performance for in a wide variety of situations. We offer a large selection of sizes and power levels to meet your needs. Stage 1 and stage 1.5 injectors for towing and the best fuel mileage. 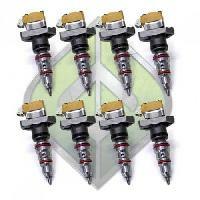 Stage 2 and Hybrid injectors for the best performance. *Injectors do not qualify for free shipping. Choose the injectors for the type of driving you want to do. If you tow, choose the smaller injectors with lower fuel output. The lower fuel output gives you more power but also lets you control your EGT levels when towing heavy. You can also tow with larger injectors if you add supporting modification that can help keep the egts lower. Towing with a stock turbo stay in th 180cc injectors size and choose a smaller nozzle. Towing with an upgrade turbo and modified air flow (exhaust & intake) you can choose a larger cc along with a larger nozzle. Don't tow and only want to go fast? Go big CC or go home. Keep in mind you can still have EGT problems. These big injectors also must have supporting modifications. Fuel system upgrades and turbo upgrades are a must have. If you want to go super big you'll have to address internal engine modifications and don't forget the drivetrain. Why are Full Force Diesel Injectors the best choice for you? Our performance injectors are all premium built. 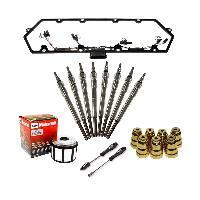 Every injector that we sell have new nozzles, new plungers and barrels, new internal springs, and new o-rings! Every injector is disassembled in our injector facility cleaned then inspected for excessive wear. We then rebuild the injector back to factory OE specs with our exclusive performance modifications. Any worn internal part that falls out of factory spec is replaced. 18 Month/Unlimited Mileage warranty on all injectors.After the build process, each injector must pass a final inspection before proceeding to our flow test station. Injectors are flow tested throughout the RPM range to ensure your injectors are matched within 1%. This will ensure you get the best idle quality and the longest service life. I guess that's what you would expect from a company that has built and sold injectors since 2004!